HUNTSVILLE, Tex. — Kenneth Wayne Davis died at 54 as not so much a man but a number: Inmate No. 327320. Mr. Davis was charged, convicted, sentenced and incarcerated for capital murder by the State of Texas after taking someone’s life on Nov. 19, 1977. But when he died in November 2011, Texas seemed his only friend. His family failed to claim his body, so the state paid for his burial. On a cold morning in this East Texas town, a group of inmates bowed their heads as a prison chaplain led a prayer for Mr. Davis, his silver-handled black metal coffin resting on wooden planks above the grave the prisoners had dug for him. Wearing sunglasses, work boots and dirt-smeared white uniforms, they might have resembled painters were they not so solemn, holding their caps and gloves in their folded hands. They were Mr. Davis’s gravediggers but also his mourners. No one who knew Mr. Davis bothered to attend his funeral, so it was left up to Damon Gibson, serving 14 years for theft, and the rest of the prison crew to stand in silence over the grave of a man they had never met. Then Mr. Gibson and the others put their gloves on and lowered the coffin into the ground using long straps, providing him eternal rest in the one place in Texas where murderers and other convicts whose bodies are unclaimed can be interred, remembered and, if but for a few moments, honored. 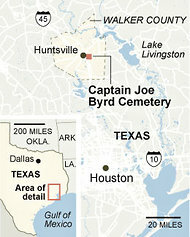 On this day, Mr. Davis’s funeral was one of seven at the Captain Joe Byrd Cemetery, the largest prison graveyard in the country, 22 acres where thousands of inmates who were executed or died while incarcerated are buried. All of them went unclaimed by their relatives after they died, but the cemetery is not a ramshackle potter’s field. It is a quiet green oasis on a wide hill near the campus of Sam Houston State University, with rows of small crosses and headstones, at the center of which stand a decorative brick well and a white-painted altar bearing a cross. The last years of these inmates’ lives were spent under armed guard behind bars and barbed wire, but there is no fence along Bowers Boulevard here, and no one keeps watch. Walking along the hill beneath the pine trees, stepping between the rows of hundreds of identical white crosses and tablet headstones, you think of Arlington National Cemetery. But if Arlington is for heroes, the Byrd cemetery is for villains. The concrete cross marking the grave of Duane Howk lists his name, inmate number and date of death in June 2010 but says nothing of the offense for which he was serving a life sentence, aggravated sexual assault of a child. The serial killer Kenneth Allen McDuff, executed in 1998 for strangling a 22-year-old pregnant mother of two with a rope, had gained notoriety for being the only inmate in United States history who was freed from death row and returned years later after killing again, but he lies beneath a nameless cross reading 999055. The state’s prison agency, the Texas Department of Criminal Justice, has been the steward of the cemetery since the first inmates were buried there in the mid-1800s, maintaining and operating it in recent decades as carefully and respectfully as any religious institution might. An inmate crew from the nearby Walls Unit prison cleans the grounds, mows the grass and trims trees four days per week. The inmates dig the graves with a backhoe and shovels, serve as pallbearers and chisel the names on the headstones by hand using metal stencils and black paint. The cemetery was named for an assistant warden at the Walls Unit who helped clean and restore the graveyard in the 1960s, and even today, the warden or one of his deputies attends every burial. Though all of those buried here were unclaimed by relatives, many family members fail to claim the bodies because they cannot afford burial expenses and want the prison agency to pay the costs instead. The same relatives who declined to claim the body will then travel to Huntsville to attend the state-paid services at the cemetery. In some ways, the cemetery and the funerals held there lack precision and formality. 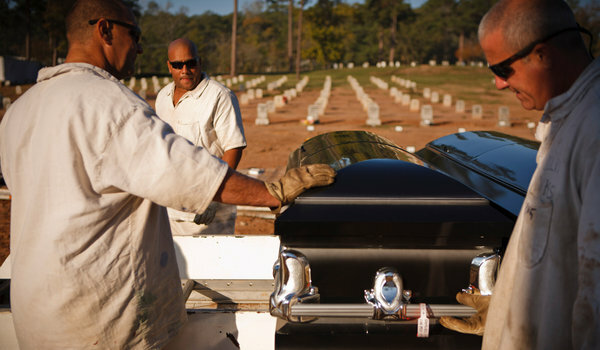 Coffins are transported from the altar at the center of the cemetery to the gravesite on a trailer hitched to the back of a green John Deere tractor. Names and words are misspelled on a few headstones and markers. Relatives have brought portable stereos to play music during the funerals, blaring rap songs and AC/DC’s “Hell’s Bells.” Most days, after the inmate crew has returned to the prison, the cemetery is a deserted, lonesome place. Of the thousands of graves, only a handful have flowers on them. Two of the seven inmates who were buried, including Mr. Davis, were serving life sentences for murder, and the others had been imprisoned for drunken driving, theft, assault, sexual assault of a child or burglary when they died. Mr. Davis spent nearly 34 of his 54 years behind bars. In the ground in Huntsville, he was finally free of his prison uniform. The funeral home that handles inmates’ burials put him in dark pants, a white shirt and a tie. Copyright 2012 The New York Times Company. Reprinted from The New York Times, National, of Thursday, January 5, 2012.